Today's post is 2 of 3 by Mrs. Jennafer Ort - who's been invested in understanding this problem for quite a few years now. In my last post I introduced the problem of modern-day slavery. It’s a problem so huge that 45.8 million people are trapped in slavery around the globe. It’s a problem so pervasive that essentially every country in the world has slaves, including the United States. And it’s a problem so personal that many of the daily purchases we make are directly supporting - even demanding - that this slave labor continues. So did you take the slavery footprint questionnaire to learn how many slaves are working for you? (www.slaveryfootprint.org) It’s a bit unreal to think of dozens of people working in violent, filthy, abusive, dangerous, and inhumane circumstances just so I can have a closet full of clothing, a house full of gadgets, and a cupboard full of food. Before you freak out, I’m not going to tell you to get rid of everything you own and commit to a life of self-sustaining simplicity in the wilderness. That’s just not practical (for most of us, anyway!). But in light of your new knowledge, I’d challenge you to not ignore the problem either. Let me recommend 3 concrete options for reducing your slavery footprint starting today. These are the same 3 things I did to bring my own slavery footprint down nearly 20% in less than 2 years. 1. Ditch it: Not sure whether the item you are planning to buy was ethically sourced? Just don’t buy it. If you are not certain whether an item is ethically sourced, it probably isn’t. Most major brand names for anything we buy – from bananas to running shoes – do not verify their raw materials are ethically sourced. So ask yourself, “Do I really need ____?” If the answer is “no,” just don’t buy it – at least not until you’ve found an ethical source. If the answer is “yes,” (or “no I don’t need it, but I really, really want it,”) then choose option 2 or 3 below! 2. Research it: There has been a recent wave of counter-action to the problem of slavery and unfair wages: it’s called “fair trade.” A growing number of organizations are ensuring their laborers are earning fair wages for their work – all the way up the supply chain. This isn’t about raising minimum wage. It’s about eliminating slavery. 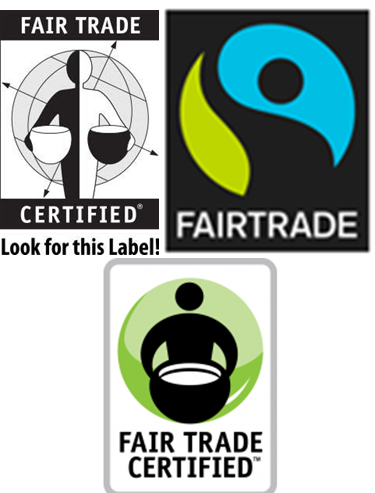 So look for brands with one of the fair trade symbols OR buy from companies who verify their products are fair trade or ethically sourced. (See the end of this post for some websites to help.) As a bonus, you can also buy products that are organic. Since organic items have to verify their sources to prove they’re organic, it’s very unlikely they can hide unethical labor in the process. 3. Localize it: When I say “localize,” I don’t mean you have to only buy products that are made locally. What I really mean is making sure your proceeds are staying local. You can most easily do this by buying items second-hand. Think about it: If you buy a t-shirt from Goodwill, the only people benefiting from your dollars are the local Goodwill employees. None of that money makes it back to unethical original sources, so you just made an ethical purchase. But when you buy that same t-shirt brand new from a store like Walmart, your dollars are directly supporting the manufacturing of that product – even if the manufacturing used slave labor somewhere along the line. Buying secondhand not only saves you money, it saves you from supporting slavery. This strategy can be used for electronics, cars, clothes, any of those items you can’t seem to find fair trade – or at least not fair trade and in your budget. Personally, I’ve used each of these strategies to some degree. For example, I’ve given up chocolate unless it’s fair trade. I’ve researched ethical sources to purchase tennis shoes and dress shoes. I’ve started buying some produce from the local farmer’s market instead of the chain grocery store. And I’ve committed to buying most of my clothing items and electronics secondhand until I can find or afford to buy them fair trade. Sometimes these choices are inconvenient or expensive. But each change is worth it to know that none of my dollars are being used to exploit slaves. You can’t do nothing anymore. You are no longer innocently ignorant. So instead, I’d like to invite you to fight against slavery. I’m asking you to re-think your purchases. I’m challenging you to try the strategies above, starting with just 1 category or purchase. You can build from there. We can all build from there, until, together, we put slavery out of business. September 08, 2017 /JC's Village C.C.M.